Story and Photos by Kevin Vallely. “It’s a high-risk job,” whispers Ibrahim Saleh, weariness etching his voice. He draws deeply on his cigarette, eyes glazed and distant, focusing on something invisible to me. After years of patrolling the jungles for poachers and illegal logging, his body language shows the strain. I’m in Indonesia to accompany patrollers deep into the jungles of Sumatra to witness first-hand the complicated and often dangerous battle between the protectors and the destroyers of the forest. It’s a fight that Ibrahim and the patrollers are proud to wage. “It’s our duty to protect this place.” Spreading from the Indian Ocean to the Malacca Strait is a vast stretch of untouched jungle, one of the largest tropical rainforest reserves in the world. At nearly 2.6 million hectares—roughly the size of Belgium—the Leuser Ecosystem is the only place on Earth where rhinoceros, elephant, orangutan and tiger live together in one place. It encompasses habitats from high alpine to low-lying swamp, and holds more than 25,000 specimens of the world’s flora and fauna, many of them endangered. It is considered one of the most significant biodiversity “hot spots” on the planet. Four million Indonesians depend on it for fresh water and flood protection. Today this vital ecological reserve is under threat. Located at the north end of Sumatra, the Leuser Ecosystem straddles the provinces of Aceh and North Sumatra and is balanced, in a very real sense, on the edge of political and geological chaos. In recent years, it has been witness to bloody civil war and a shocking natural disaster, and throughout has suffered the scourge of illegal logging and poaching. Political mandates and conservation efforts created by the Indonesian government to protect the reserve are overseen by a system that was deemed in 2006 to be the most corrupt in Asia by the Hong Kong-based Political and Economic Risk Consultancy. It’s clear the protectors of the Leuser have some major battles to contend with. “We’re at war here to save this forest,” states Greg McDonald, communications officer for Leuser International Foundation (LIF), a Sumatra-based organization. The mission has become McDonald’s as well. The tall, thin Australian has a shy demeanour but he’s anything but timid. “Sometimes you get really angry but you can’t be heavy-handed. We need to be in touch with the people on the ground. 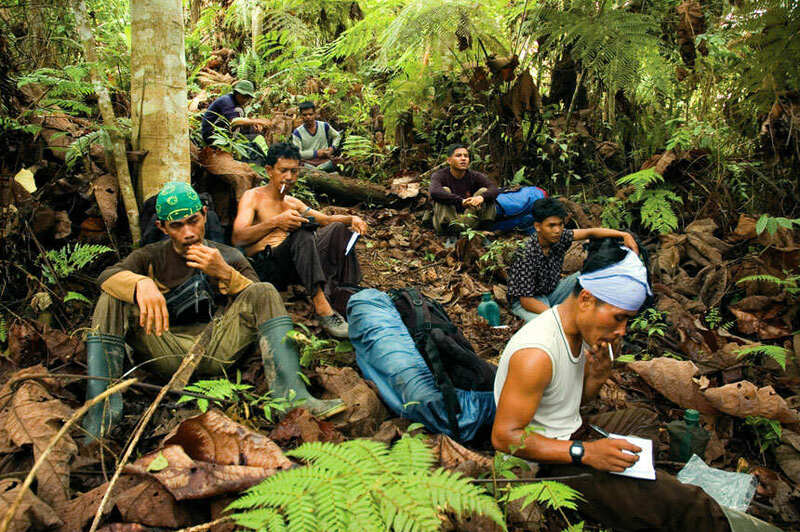 That’s why we like to use the patrols.” These initial jungle forays—the forest patrols—became the basis for LIF’s most effective tool in combating the criminal activity that brings death and destruction to the reserve. I first learned of the patrols and their enforcement strategies from a friend, Paul Dillon, who was then working in the region. He described teams of elite rangers, some atop enormous Asian elephants, heading deep into the jungles in pursuit of poachers and illegal loggers. I found the image compelling. I decide to join a patrol, ask Paul to join me, get a thumbs-up from LIF, and before you know it, I’m aboard a plane bound for Sumatra—one of the most exotic places on Earth. It was like being teleported; the feeling of being plucked from the routine of my daily life and dropped into an utterly different reality, my mind swimming with the apprehension and uncertainty at joining the patrollers in their quest to catch a potentially hostile adversary, all of the time feeling lured on by curiosity. I arrive in the city of Medan and start to melt. The blanket of heat and humidity embraces me. A scrum of men waits outside the airport for no one, until they spot me. Within moments, I’m surrounded. “Mau kemana?” (Where are you going?). “Dari mana?” (Where are you from?). My friendly interrogators’ questions continue unabated until my ride finally arrives. I rendezvous with Paul and immediately we’re whisked to the LIF headquarters. A quick debriefing informs us that we’ll accompany two unique squads into the Leuser reserve; the first, an elephant patrol unit that guards a fragile swamp region from the voracious oil palm industry and the other an elite mountain foot patrol to journey deep into the heart of rhino and tiger country pursuing poachers and illegal loggers. Both units are unarmed, yet the criminals they track might not be. It hits me like a punch, I’ve arrived. The Unit Patroli Gajah (UPG or Elephant Patrol Unit) is located five pulse-quickening hours north in Aras Napal on the edge of the Leuser Ecosystem. Driving in Indonesia is unlike anything I’ve ever experienced. Oncoming vehicles hurtle by in the wrong lane, horns blaring and lights flashing, while motorcycles buzz incessantly like agitated insects, always near but never quite touching. Overloaded trucks lumber along at impossibly slow speeds, belching clouds of acrid black smoke, becoming one more obstacle for the frenzied drivers to out-manoeuvre. Arriving at Aras River Valley. The road gets progressively worse until finally it disappears in the remnants of a village at the edge of a chocolate-brown river. When we arrive, the community is rebuilding after saddling up to join. Unfortunately, the expression “saddling up” isn’t accurate as there are no saddles or supports of any kind, just a thin rope around each elephant’s neck. 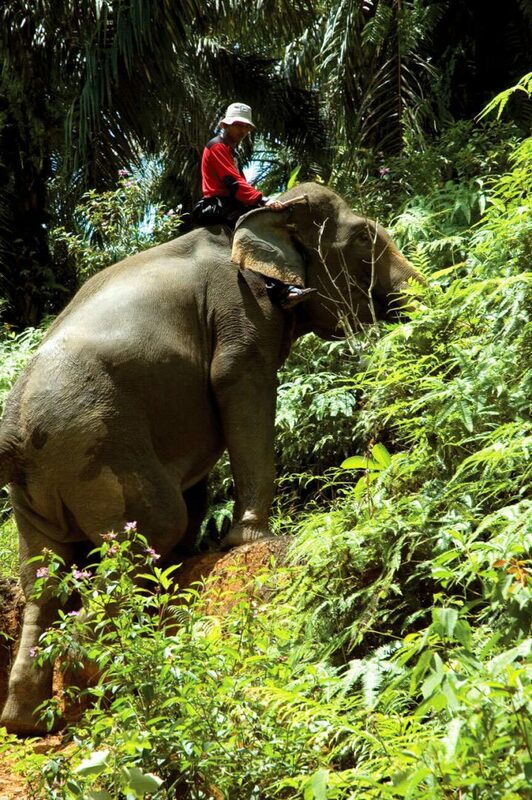 On command, Rio lowers to his knees and mahout Haris hops on top. I’m given the nod to dive on back and then with one big jerk the beast stands up. It’s like sitting on the back of a motorcycle perched nearly four metres in the air with nothing to hold onto but the driver’s waist. At first I’m discrete and tentative with my contact but before long I’m hanging on familiarly, as for dear life. We approach the riverbank and scan for an easy way down. From my vantage point it looks impossibly steep, but Rio has other thoughts. I’m thrown forward as my five-ton beast begins his descent. He likes the water and there’s no stopping him. He navigates the slope effortlessly and begins marching through the crosscurrent to the opposite shore. I’m so focused on staying out of the river that I only notice the small village when we crest the bank. It’s in a terrible state. Debris is scattered everywhere and homes are in various stages of reconstruction, but we’re still warmly greeted with smiles and enthusiastic waves. The villagers here are grateful for the patrollers. Recently, the patrollers saved their lives. Four months ago, an immense flood inundated the region and completely submerged the community. UPG members recall how the river overflowed its banks and kept rising. It was like nothing they’d ever seen. On the first evening, people bundled into their canoes and hung onto what they could. By the second afternoon, they were straddling the largest roof in camp, waiting for helicopter evacuation. As the water continued to rise, several team members, risking their own lives, paddled to the neighbouring village and rescued people stranded on roofs and in treetops. In the end, the water level crested at more than 12 metres but thanks to the unit, no one died. Three of the four elephants were out on patrol during the disaster and were kept safely away from the ordeal. But because Dion’s mahout was in hospital fighting malaria, Dion was left behind. The flood had swept in so fast that the trainers had no time to release him from his leg leash. They watched in horror as the flood water overwhelmed the ensnared animal and submerged him. The only thing left visible was his trunk, fully extended like a snorkel, gasping for air. He remained like this for two days. That Dion survived the ordeal at all is astonishing. That he’s on patrol with us today speaks volumes for the fortitude of this animal and for these elephants in general. The flood was the worst on record and is directly attributed to the illegal logging that occurred upstream. Rainwater that would normally be absorbed by the soil runs off the denuded jungle slopes and triggers landslides, which release large amounts of silt and forest debris into the waterways. The result is larger and more destructive floods. Illegal logging within the patrol area has dropped significantly since the deployment of the unit, but the battle is an ongoing one. By midday, we’ve covered close to ten kilometres along the edge of the park. The patrollers are looking for incursions from the oil palm plantations that buffer the ecosystem or anything else that seems suspect. We traverse a steep slope at the far end of our loop when a UPG member notices something suspicious and two of the elephants head off to investigate. We won’t see them for the rest of the day. Organic armoured personnel carriers on patrol. We stop at a vast section of land that’s been logged recently, the result of a massive illegal slash-and-burn operation that the patrollers discovered. It’s a tremendous success for the UPG unit, not only because they destroyed the logging camp and everything in it, but because the culprits who had destroyed the forest were successfully prosecuted. In the past, these individuals would be routinely released after kickbacks were paid to the police. Recently, the authorities have started to take the crime of illegal logging seriously, but the problem still exists. As a precaution against the bad old days, the mahouts insist that the confiscated equipment receive the “elephant two-step” before being handed over to the police. Taking a rest in the jungle. A war of independence between separatist rebels and the Indonesian government has been simmering in Aceh since 1976. It reached a flashpoint in 2003 when martial law was declared and the Indonesian military waged a full-scale war on the rebel army (Gerakan Aceh Merdeka or Free Aceh Movement, known as GAM), killing thousands of people in a clandestine operation. Then suddenly on the morning of Dec. 26, 2004, the area got the world’s attention. Everything was about to change. A 9.0-plus-magnitude earthquake off the northwestern coast of Sumatra unleashed one of the largest tsunamis in recorded history. Minutes later a black wall 15 metres in from the depths of the sea and levelled itself on the coast of Aceh. Four gigantic waves rolled over the region, killing 170,000 people. Hundreds of journalists swarmed the province. The world was watching; Indonesia couldn’t keep its war hidden any longer. Enormous sums of money were being offered to the country as disaster relief by the international community, contingent on the resolution of the conflict. On Aug. 15, 2005, a peace deal (a Memorandum of Understanding) between GAM and the Indonesian government was signed in Helsinki, Finland. The war was declared over. Travelling in Aceh, even these days, is a dicey affair and, officially, special permits are required to enter the region. The rules are changing quickly and we’re advised not to seek the permits for fear of exposing ourselves to even more problems—read opportunities to be bribed. After retracing our route back to Medan, Paul and I are driven another seven hours to the start of the foot patrol outside the town of Kutacane. We hold our breath as we routinely come across polisi (police) checkpoints en route. They have an ominous appearance, nothing more than empty oil drums on either side of the road with wooden planks strewn between. But you never know what will happen if you’re stopped. Fortunately, we’re not. 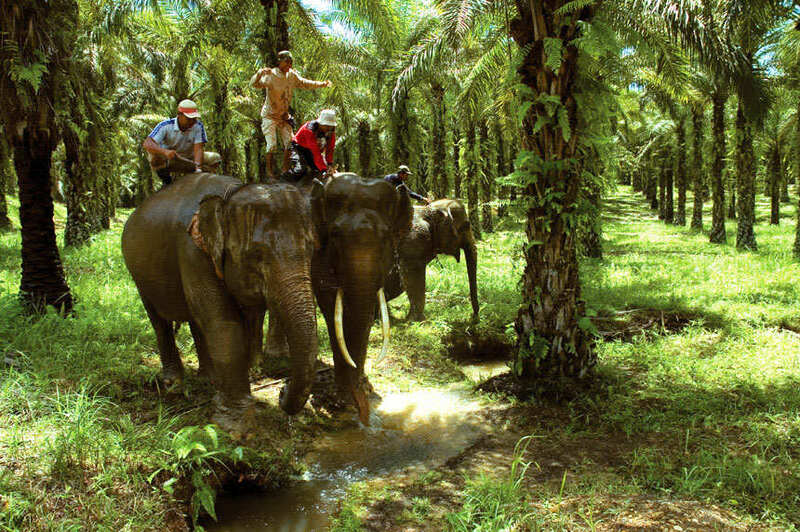 The expanse of the Leuser Ecosystem consists of two giant lobes, divided in the middle by a road that connects the provinces of Aceh and North Sumatra. As one moves from south to north, the interior edges of the lobes close in on themselves until they finally touch at Kutacane in the centre of the reserve. Beyond this point, the lobes completely merge as the road continues north, cutting through the jungle. Paul and I arrive in Kutacane after dark. We’ll be heading out with the foot patrol before light and decide to have a few beers and do some catching up. We hadn’t seen one another in ages. Easier said than done. Aceh adheres to Sharia (Islamic law) and drinking alcohol is considered an offence but, as with most things Indonesian, the rule is negotiable. It’s a sad joke among locals that at the end of an evening of arresting people at bars, many of the police head out for a nightcap themselves. We find a few warm brewskies and cautiously kick back. Paul has worked as a journalist in Indonesia for the better part of the last decade and has spent much of that time following stories that few others would attempt to. Be it flying into East Timor as the capital burned and murderous militias prowled the streets to shadowing Dayak headhunters in Kalimantan as they attempted to ethnically cleanse the Madurese, his approach to life has been nothing short of daring. Were it not for him, I would not be on this trip. It’s a very early start as we meet up with the patrol group, about an hour’s drive out of town. We’re following a special unit of patrollers—comprised of three teams of four—for three days of a 14-day tour. These extended traverses are critical in the effort to monitor the health of the ecosystem and we’re lucky to get the chance to join one. We congregate in the tiny village of Deleng Megakhe at the edge of the river valley, with the jungle-clad mountains of the Leuser rising before us. The commanders of each of the three patrols meet with the village head, as is custom in Indonesia, and explain to him why we are here. There’s nothing novel in this. The patrols have been to the village many times before and even have caught some of the inhabitants involved in illegal activities in the parkland. The mood is cool and cautious but civil, as each side clearly understands the other. The provincial government in Aceh has banned all logging in the reserve but this means little to corrupt officials at the district level. They pay members of the army and the police to protect them and then they convince the villagers to do the dirty work for them. 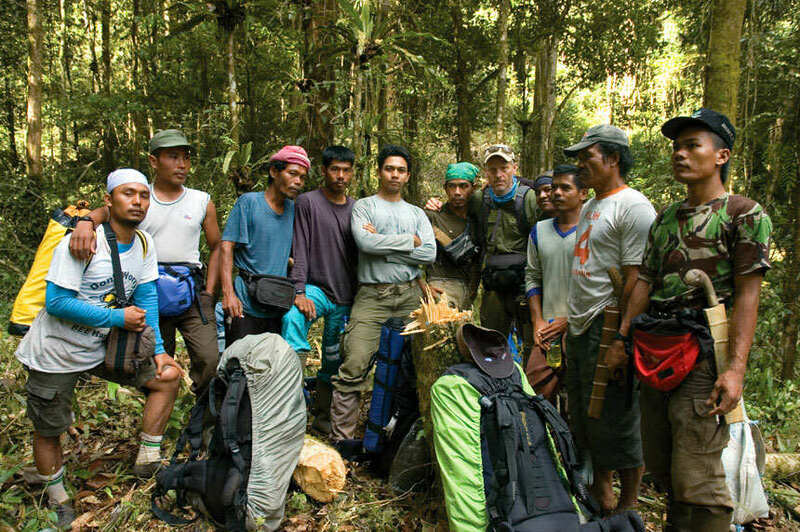 The top dog in this area is Armen Deski, who became rich running illegal logging operations during the war. He’s the district head of Aceh Tenggarra. Forty percent of the Acehnese live in abject poverty, surviving on the equivalent of $1 US dollar a day. It’s a hand-to-mouth existence with no promise of a better future. The residents of this village fall squarely within the 40 percent. The jungle provides them with the possibility of additional income and they do what they must. It’s hard to blame them for their transgressions. After exchanging pleasantries with the village leader, we begin our ascent into the hills and it becomes clear quickly that we’re in for a tough slog. The patrollers are carrying huge packs stuffed with two week’s provisions, yet their pace is steady and fast. “The speed is not too difficult?” asks a patroller marching beside me. “The speed’s just fine,” I lie. Our route ascends through open forests overlooking the magnificent Alas River Valley that sweeps like a giant fan across the horizon and disappears into a haze of morning mist. It’s still early but the intensity of the equatorial sun is already upon us. The tempo of the day falls into a rhythm that I’m accustomed to, patrollers trekking at their own pace and then stopping to regroup and rest. They find shaded spots, cut palm fronds with their machetes for mats and then relax and listen. The jungle is a symphony of sound as the piercing soprano of the insect section builds and subsides to the steady throb of the gibbon bass. The smell of clove-tinged cigarette smoke fills the air as the patrollers, to a man, light up and enjoy their hourly ritual. “You don’t smoke? !” asks a puzzled patroller after offering me a cigarette. He smiles and shakes his head. It’s walk-stop-smoke (repeat as necessary) until lunch and then walk-stop-smoke (repeat as necessary) until camp. I came on this trek believing I was fit but I’m working very hard to keep up with these guys. By day’s end I’m shattered. My chain-smoking companions seem completely unaffected by the march as they unpack their gear, ready the camp and light up, of course. Our first night’s stop is at a small shelter cabin that’s high on a ridge, with a view that overlooks the mountains of the reserve. A small area of deadfall is visible on a subsidiary ridge but otherwise it’s trees as far as the eye can see. The three patrol units casually migrate into their individual groups, then it’s an early night for all. The smell of coffee at daybreak draws me out of my slumber and I’m soon being made a cup of cowboy kopi, forest-patrol style. It’s simple to prepare: in a small six-ounce cup, mix two tablespoons of finely ground Sumatran coffee with 12 teaspoons of sugar, stir, sip and get jacked. The patrollers like it. These guys apparently survive on sugar, coffee, rice and tobacco with a modicum of salted fish sprinkled in for protein. It’s not a diet of champions, but no one cares a whole lot after the coffee kicks in. Day two gets us over the slopes of the Alas valley and deeper into the ecosystem. The trail becomes more and more challenging as the impenetrable walls of green, which define its edge, draw in tight. I focus on nothing but the moment, very Zen, moving in a trancelike state, all senses heightened. I’m struck by the smell of the jungle, a strange odour of life and death that seems to repulse and appeal at the same time. The yin-yang reality. “Have you ever seen a tiger out here?” I ask the patroller named Lis Fehesdi. On our first morning break, I notice a member of the unit putting together an apparatus that looks disturbingly like a bomb. He holds two sticks of something that could be dynamite, and is attaching wires to the end of it. My curiosity’s piqued. Is it a booby trap or something for the units’ protection? “A homemade cellphone battery charger,” a patroller tells me. Interestingly, the fellow making the charger is an ex-guerrilla fighter; in fact, an explosives expert. He spent 10 years living in the jungle during the war and his nickname, Ucil (the young one), suggests his youthful age when he joined the guerrillas. Pange (dark commander), is the other ex-GAM fighter in our group. 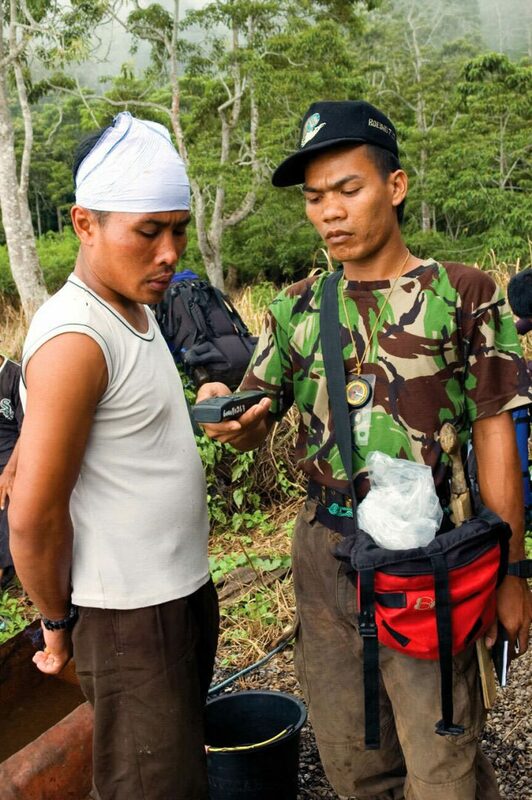 In a strange twist of fate, the war was good for the Leuser Ecosystem. Illegal loggers and poachers were typically too frightened to enter the jungle for fear of being mistaken for combatants. The same held true for the patrollers, but they went anyway. Ibrahim Saleh is probably the oldest member of the group and he explains to me how he and his monitoring team ran into Ucil and Pange’s GAM unit during the war. We make camp at a huge clearing the team discovered a month earlier. “This area had been cleared for a marijuana crop,” says one of the patrollers. “It was difficult to find but we caught them.” The culprits used axes instead of chainsaws so they wouldn’t draw attention to themselves and were strategic in their cutting so they wouldn’t be spotted from the air. It seems such a frustrating battle but the patrollers are proud of what they do. A group of villagers recently headed into the reserve with the intent of clearing a known swamp region for rice cultivation. What they didn’t know was that the area is a vital habitat for the rhino. “They had a head start but I was able to catch them after two days,” explains Saleh. “After much talking I was able to persuade them to come back.” It would seem he single-handedly saved one of the last remaining Sumatran rhino populations left in existence. It all feels so incredibly tenuous to me. On day three, we say goodbye to our new friends and head back out. We’re accompanied by Win, who also needs to make a speedy exit. He is planning to lead a bold nighttime raid on an armed logging encampment in a couple nights. We’re moving quickly down the mountainside when Win stops. He notices a small trail leading into the bush and we follow it. A short distance in, we discover a newly erected lean-to with bedding rolled up and clothes on the line. A fire’s still going and there’s hot coffee in cups. “Where is everyone?” I ask innocently. We make great time and by late afternoon, we’re back in the village from where we started. Our reception is cold. The villagers hadn’t expected us back so soon and likely think we’ve discovered something. They’re right. We make our way to the small warung (local eatery) where the village head is sitting to pay our respects. He flashes us a toothless smile and asks us to join him for tea. An uneasy silence fills the air. And here lies LIF’s biggest problem, one that needs to be addressed on the international stage. The poor villager can’t be blamed for doing what he must to survive. Until legislation is put in place to convince him that an intact forest is in his best interest, the battle to save the jungle will be a gruelling, near-unwinnable one. 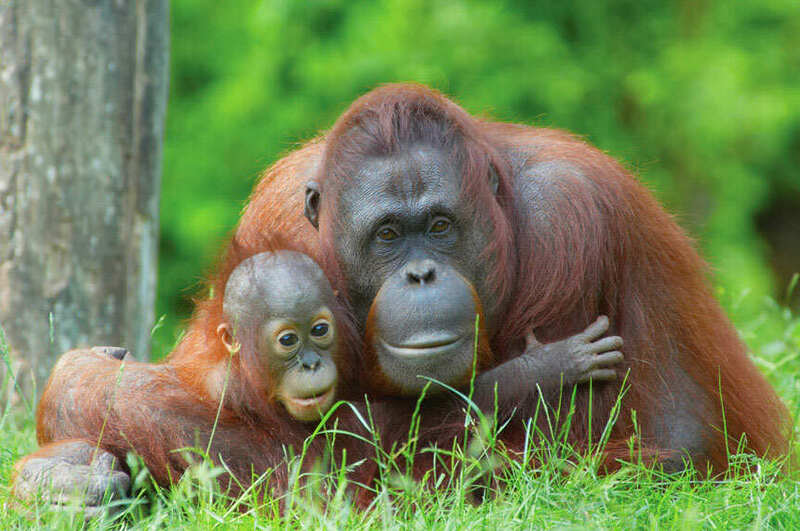 The Leuser Ecosystem is home to orangutans. An experimental program called carbon-ranching is presently underway in Madagascar and might hold the answer to this quandary. First-world polluters are being allowed to make up for their greenhouse gas emissions by paying Madagascar to preserve its tropical rainforest. They pay 10 times more per hectare than the highest crop yield would provide. Madagascar, in turn, uses the money to protect its forests and pay for poverty-reduction programs. The Leuser Ecosystem, like all tropical rainforests, is a huge carbon sponge, storing around 500 tons of carbon dioxide per hectare. This carbon-storing capacity might be its best hope for survival. And not just for the forest’s survival, but for everyone’s. The protection of jungle ecosystems must soon become a component of future climate legislation. When it does, the job of the jungle patroller will become that much easier. We finish our tea and quietly slip out of the village. 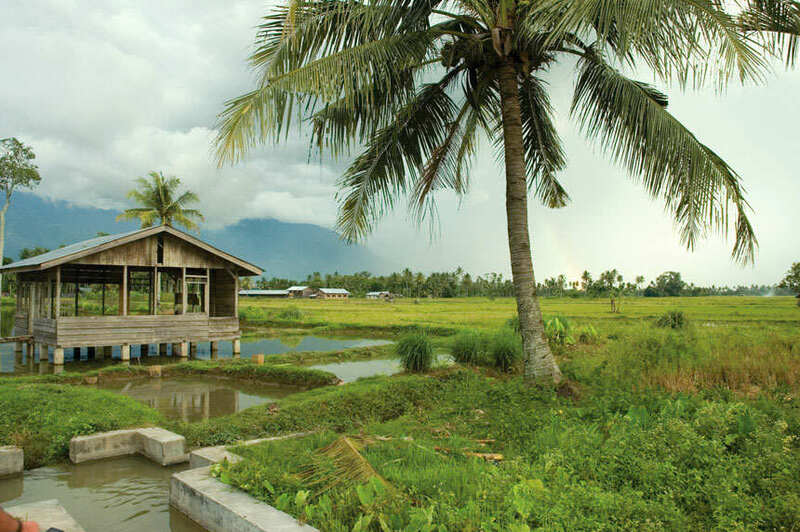 The jungle-clad mountains of the Leuser Ecosystem surround us, its vastness creating the illusion of permanence. But like many of the giants that inhabit it, it’s often the mightiest of things that are truly the most fragile. Kevin Vallely is a highly-regarded expeditioner and adventure-athlete, as well as contributor to Outpost Travel Media. He lives in Vancouver with this family.